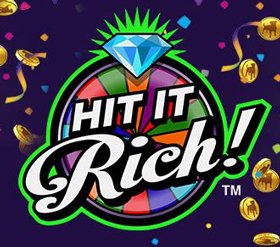 Yippee - you all got rid ( or at least you are in the process ) of the charms on hit it rich !! Now please gid rid of or improve your 2 hour coin wheel . I always get 800,000 .1 million , 1.2 million , or any other low denomination when I spin . Why have the big numbers on there when you know the wheel is set (or rigged) to land on certain numbers . If that is the case, then please increase the "lower" numbers to 5 million and above ( 10 million would be ideal ) and then everybody wouldnt be so "poor) knowing that they wouldnt have to wait too long to bank some coins and start playing again if for instance they were bankrupt. And thats what you want right ? Us playing your games ?? Also, see what you can do to improve the daily race feature , I have giwen up on that because I dont have the coins to compete with the "big guys" . It is a great idea but now i think its only for the big time winners ( like the Yankees and Dodgers of baseball ) that can win this feature. Can you come up with something competitive for us that dont have that kind of coinage?? Thanks ! !